I always buy the best beef for the barbecue and serve it rare, for a real treat. The red wine vinaigrette turns it into a dish smart enough for a dinner party. Learn how to judge the doneness of meat by touch: relax your left hand, and place the tip of the thumb and forefinger together; the muscle at the base of your thumb will feel soft – that’s what rare should feel like. Move your thumb to the tip of the fourth finger and feel again for the slight resistance of medium rare; touch the tips of your thumb and little finger together and you should be able to feel the firm resistance of well-done meat. Start the vinaigrette in advance. Boil the red wine for about 10 minutes, uncovered, until reduced to 100ml. Add the vinegar and sugar, continue stirring for 1 minute, then cool. Heat the barbecue to medium heat. Brush the beef in the olive oil and balsamic vinegar and rub with some sea salt and black pepper. Grill the beef on each side until it is crusty and well-browned – about 20 minutes altogether. When you press the surface with your finger, it should still be a little springy to the touch. Wrap in kitchen foil and leave to rest for 20 minutes. To serve the beef, remove the string, carve and arrange the slices, slightly overlapping, on a serving platter. Whisk the olive oil for the vinaigrette into the prepared dressing, season, and serve it with the beef. 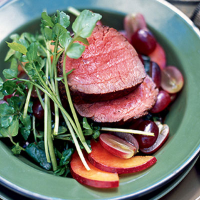 Toss the grapes, watercress and plums in a little more olive oil and balsamic vinegar and serve with the meat. An easy-going yet deep Mexican red makes a fine outdoor partner for rare beef.